There is a lot of work being done in the school grounds at present ranging from painting benches to planting the various flower beds. A big thank you to everyone who is helping with this. Earlier this week Oswestry Council very kindly donated some plants to school so Mrs Rothera and teams of pupils have been planting these out along with the other plants. Mr Jeffrey and Mr Pugh have continued with the re-furbishing of playground furniture as well as removing the broken parts of the pergola. It is planned to keep the pergola beds where they are and replant these. 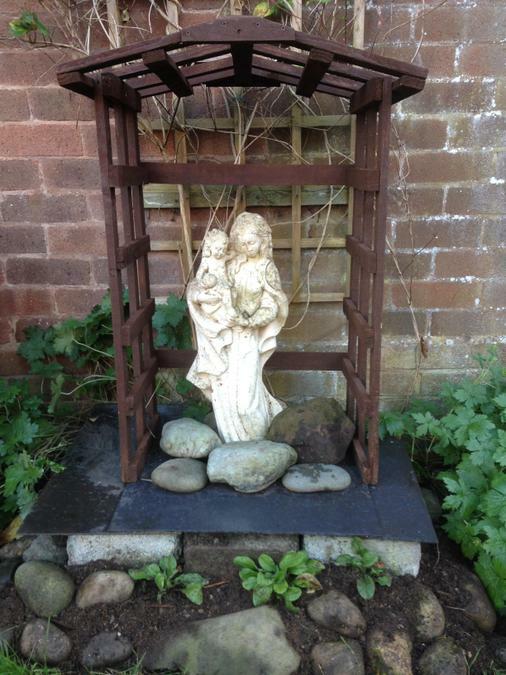 However the lovely statue of Mary that is on loan to school from Mrs Freda Jones has had to be moved and now is the focal point of Mary's Garden. We are planning a special planting by the new access ramp and steps to the demountable building. For this we would like wellington boots - of all sizes and colours. If you have any unwanted boots please leave these inside the gates when bringing children to school.